KPEV ‘Posen 1107’, then ‘Osten 1135’ (Henschel 11512/1913) later became 17 1055 and was withdrawn from DR in 1963. Since 1971 a museum locomotive in the KPEV livery. Photographed in August 1971 by Werner Nagel (postcard from my collection). and of ‘Bauart 1914’; both picture from Dampflok-Archiv 1 (see References). 17 1074, DR (Henschel 11768/1913), Cottbus depot, Germany, 1955. Photo collection Martin Stertz via T.Galka. No. 1110, Reichs-Eisenbahn Elsass-Lothringen, Henschel 12605/1914. After the war this locomotive went to France and finally became SNCF 250-G-110. Photo from my collection. First Prussian express locomotive with three driven axles, class S10 (later DRG 170-1) of 1910, broadly based on the very successful P8, was not entirely satisfactory. After several modifications, which included enlarged boiler and higher steam pressure, it was finally accepted for production, but total output was not high, numbering just 207 examples, including five for Lübeck-Büchener Eisenbahn (LBE). Production was terminated in 1914. S10 featured a four-cylinder single-expansion steam engine and, almost immediately after the original design submitted by BMAG (Schwartzkopff) had been accepted, Henschel proposed a compound version. Designated S101, new engine was slightly longer and heavier. Modified boiler featured larger grate and increased evaporating surface; superheater surface was in turn reduced. Boiler pressure was increased from 14 to 15 bar and maximum speed was set at 120 km/h. 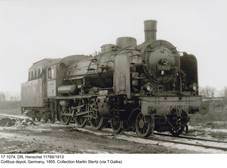 Prototype (Halle 1101, Henschel 10865/1911) proved successful and until 1914, 125 engines of this type were built for KPEV, plus four more for state railways of then-German Alsace-Lorraine. In 1915, Linke-Hofmann built ten more for Prussian railways. All these engines were known as ‘Bauart 1911’ and individual batches (five in all) differed in minor details. In 1913 a modified variant appeared, with further redesigned boiler, feedwater pump and feedwater heater. It was accepted for production as ‘Bauart 1914’, 102 examples being built by Henschel until 1916, plus thirteen for Alsace-Lorraine. This gives 254 examples in all (234 by Henschel and 20 by Linke-Hofmann). They were followed by class S102 with three-cylinder compound steam engine. S101s originally were not fitted with smoke lifters, which were introduced in 1916. Initially they had gas headlights, replaced by electric lighting in 1930s. First engines were coupled with 2’2’T21,5 tenders (designed for the P8), later these were replaced by larger 2’2’T31,5s. Other modifications included fitting Ramsbottom safety valves instead of Pop-Coale units, used in first production examples. After WWI, most of these engines remained in Germany (DRG class 1710-12); contrary to class S10 (170), almost entirely withdrawn before 1939, most of them survived until the war. Seventeen examples from Alsace-Lorraine went to France and were re-numbered 1101 through 1117; later they were joined by five (some older sources give four) ex-KPEV S101s, which became 1118 through 1122 with Chemins de Fer d’Alsace-Lorraine (AL). After nationalization all were incorporated into SNCF class 1-230G. Belgian railways SNCB took over three examples, numbered 6110, 6117 and 6127. 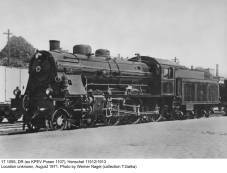 The largest batch went to Poland – PKP acquired twenty engines, later classed Pk2. Together with ex-S10s (PKP class Pk1) and Austro-Hungarian 310s (Pn12) they were among the most modern and valuable express locomotives; no wonder, thus, that they hauled the most prestigious trains, including transit ones to Eastern Prussia via the ‘Polish Corridor’. Their gradual demise started only after superior indigenous Pt31s appeared in quantity in mid-1930s, but all survived in service until 1939. Most served in Central and Western Poland (their axle load made them rather unsuitable for weak tracks that dominated in the East), so all except two (Pk2-12 and Pk2-15) fell into German hands; the latter joined after the assault on the Soviet Union. They were re-numbered 17 1210 through 1219 (‘Bauart 1914’) and 1250 through 1259 (‘Bauart 1911’). Only five were returned after the war, plus one (ex Pk2-2) from DR in 1956 – the latter saw no service and was scrapped. They were, however, joined by a number of ex-DRG engines and the highest number in post-war PKP service was Pk2-42. Two particular examples break the otherwise uninterrupted numbering sequence. 17 1089 (Henschel 11783/1913), scheduled to become Pk2-40, went to Austrian ÖBB, was re-numbered 617.1089 and survived until 1953. Pk2-26 is more problematic. Some sources (see DL) identify this engine as former 17 179 (BMAG 5187/1914), i.e. an S10; on the other side, boiler number is of an S101. A plain mistake cannot be excluded. There are also suggestions that Pk2-26 might in fact be ex-SNCB 6117, which – according to some sources – was brought by Germans during the war. Confirmation is still lacking. Post-war service of these locomotives was comparatively short: appearance of the Pt47 rendered them outdated. Withdrawals started in the earnest in mid-1950s and the last one, Pk2-17 (Henschel 11782/1913, KPEV Stettin 1115, DRG 17 1088) was written off in May 1959. Polish Pk2s were outlived by those with DR in Eastern Germany, which survived in service until mid-1960s; some were converted to coal briquette firing, in order to burn low-grade coals. Not a single Pk2 has been preserved in Poland and the only S101 that has survived until today is ex-DR 17 1055 (Henschel 11512/1913), withdrawn from service in 1963, which can be seen at the Verkehrsmuseum Dresden. 1) Data in brackets for ‘Bauart 1914’. 2) After WWII – the ‘problematic’ Pk2-26 is included. - Dampflok-Archiv 1 by Manfred Weisbrod, Hans Müller and Wolfgang Petznick (Transpress, 1976).